Yukimura is a valiant warrior who fights until the bitter end. 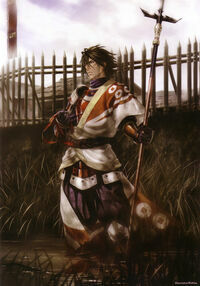 Beginning his career under Shingen, he assists his lord's pincer attack at Kawanakajima. When Kenshin uses the fog to ambush Shingen's main camp, Yukimura climbs down the mountain to hurry to his lord's rescue. Surrounding Kenshin once more in a pincer leads to a victory for the Takeda. Invigorated to realize Shingen's march to the capital, he is confused with Shingen's cautious measures against the weaker Ieyasu. Told to calm himself, he follows his lord's orders obediently during the encounter at Mikatagahara. To turn the tables, Hanzō plans to assassinate Shingen for his master.